My first trip to Walt Disney World was in 1991, when I was just three years old. At that time, EPCOT Center was still virtually the same as it was in the mid and late 80's, so it still retained a lot of the original idea that it had been born from: Using the wonders of modern technology and mutual understanding to create a better and brighter tomorrow. When you're exposed to such a profound concept at such a young age, it continues to resonate in your imagination for years afterwards. Though EPCOT Center as a whole was completely enchanting and mesmerizing at the time, Horizons was the one pavilion that really stood out in my mind. While gathering information for the archive, I became acquainted with Brian Scala, a fellow Horizons fan with a passion for preserving its history. "I was eight years old when I first visited WDW/EPCOT Center. I was a bit of a computer geek back then, so EPCOT was my own little Fantasyland, so to speak. 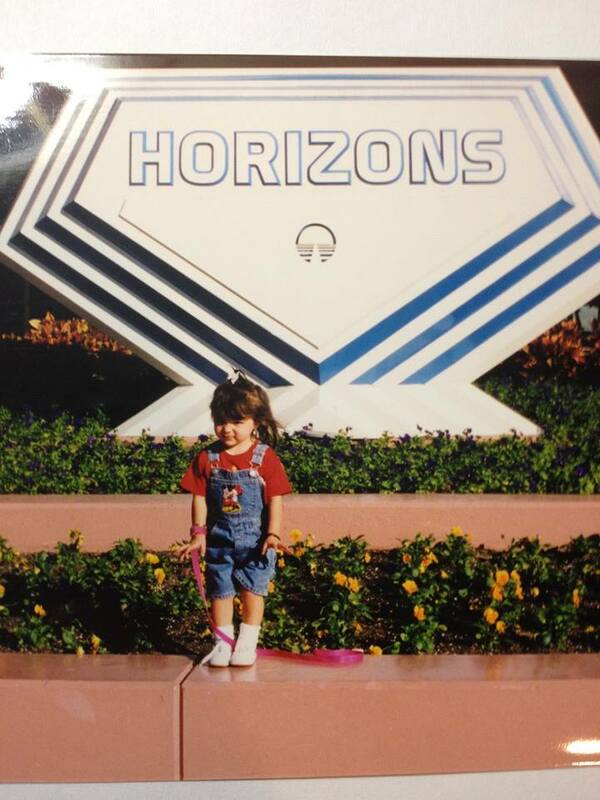 I don't remember much about my first time on Horizons. I know I was blown away at the overall presentation of Horizons. Plus, I had never been on a ride to that point where you could choose your own ending. In later years, I became deeply moved by the Omnimax loop. In the part where they show us a computerized view of earth, it really felt as it you were soaring along with them. My father, my stepmother and I would ride in the same car and each pick one of the endings to see which one came up in the event of a three-way tie. It was random every time. We did this more than once... I loved the synergy where you would see Tom Fitzgerald as the boyfriend talking with Corine Cook in animatronic form and then in the next scene, it was her talking to Tom Fitzgerald's animatronic self. I miss the attraction terribly and endorse any and all attempts to preserve its history. Thank you!" After reading Brian's account of his memories of Horizons and receiving Sam's picture of Alexandra, I began to think about just how many children were influenced and inspired by Horizons, during its brief but potent existence. Do you have a favorite childhood memory of Horizons? What kind of an impact did it have on your life? If you'd like to share your story, you can leave it in the comments below, on the Looking Back At Tomorrow Facebook page, or email your story to: LookingBackAtTomorrowArchive@gmail.com. That's so wonderful to hear, Luke. I'm so happy you found the archive. Thanks so much for sharing that! The archive is already beginning to grow!